The vast digital humanities tent can seem overwhelming at times. The easier path would be to sit by the pleasant campfire at the site next door and toast marshmallows. But as 15 Fordham University faculty and graduate students learned during the Omeka workshop on April 3, the barrier to entry into the tent is quite low. 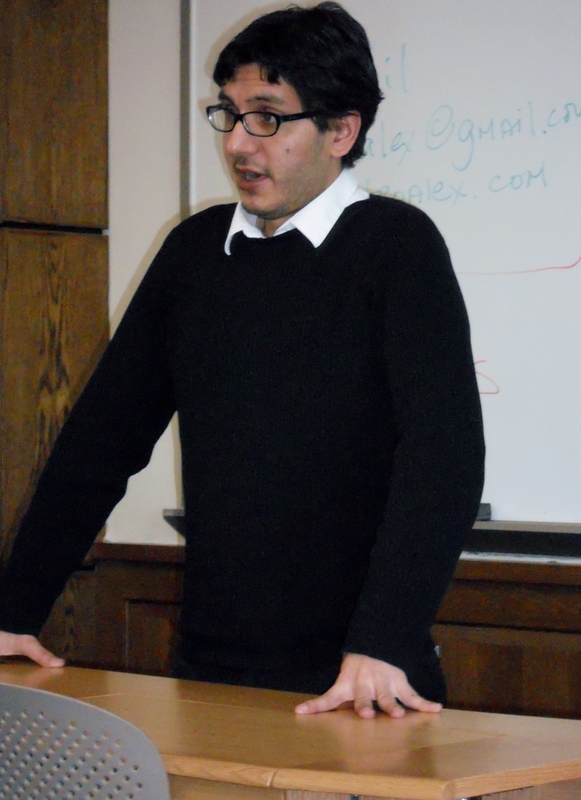 Alex Gil, Columbia University’s Digital Scholarship Coordinator, did a terrific job leading the workshop. Omeka, as Wikipedia defines it, is a free, open source, content management system for online collections. It was developed by the Roy Rosenzweig Center for History and New Media at George Mason University, and was given a technology collaboration award by the Andrew Mellon Foundation. Omeka is used by researchers, archivists, museum curators, students, and teachers. For this workshop, Alex showed us a few notable sites–or exhibits, as they’re called–that use Omeka, including “Lincoln at 200,” a collaborative project involving the Newberry Library, the Chicago History Museum, and the Abraham Lincoln Bicentennial Commission. Then he carefully walked us through the procedure for creating an Omeka exhibit. Workshop participants brought a diverse collection of material to work on: from medieval manuscripts to pre-Columbian art to personal photographs. The group felt so enthusiastic about Omeka, that a few participants have decided to reconvene in a few weeks and help each other develop their work. Marshmallows will be served. If you missed the workshop and want to learn more about Omeka, you’re welcome to join us. More details coming soon. The Omeka Workshop was sponsored by the Center for Teaching Excellence and the Fordham Graduate Student Digital Humanities Group.